Tissues are composed of many cells. These cells may be of one type or different types. The cells in a tissue are held by tight junctions. All the cells in a tissue have similar organization. Simple tissues: The tissues with similar type of cells are called simple tissues. Examples: parenchyma..collenchyma and sc lerenchyma. Compound tissues: The tissues with different types of cell are called compound tissues. Example: Xylem and phloem. Xylem is composed of tracheal cell, vessel cell and parenchymatous cells. Phloem is composed of sieve cells. companion cells and parenchymatous cells. The simple tissues with cells having thin and elastic Walls are called parenchyma. Parenchyma forms the main ground tissues. They are continuous throughout the body. They are present in root, stem and leaves. The parenchyma cells have active protoplast. They have prominent nucleus. These cells have thin primary and secondary elastic walls. Their %sans are chiefly composed of cellulose. These cells are closely packed. But intercellular spaces are produced by the dissolution of middle lamella. These air spaces are common for exchange of gases. Aerenchymas have prominent intercellular spaces. 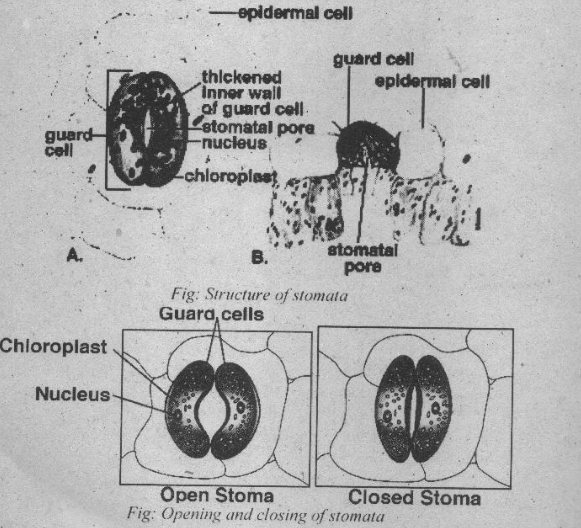 The protoplast of the adjacent cells is connected by plasmodesmata. The parenchyma has different shapes. Polyhedral: These cells are mostly polyhedral in shape. Stellate: These parenchyma are kund in the stems of plants. They have well developed air spaces between them. Elongated: Elongated parenchymas are found in the palisade tissue of leaf. Lobed: Lobed parenchymas are found in spongy and palisade mesophyll tissues of some plants. Parenchyma are mostly primary in origin. But they are also produced as a result of secondary gro>>th. Parenchyma cells are less specialized. But it performs major activities in the cell. Photosynthesis: Some parenchymas are involved in photosynthesis. The parenchyma cells of mesophyll tissues of leaves are rich in chloroplast. They are called assimilatory parenchyma or chlorenchyma. Storage: Parenck ma also store food in fruits and roots etc. They are called storage parenchyma. These parenchymas have many leucoplasts in their cells. These parenchyma stores starch. fats, oils and other granules. Storage parenchymas are common in the cortex of stem, root and seeds. Ground tissues: Parenchyma acts as ground tissues in most of the tissues. Secretory and excretory structure: In certain cases. parenchyma acts are secretor> and excretory structure. Pigmented cells: Parench> ma cells of flowers and fruits contain chromoplast. It gives colours to petals and fruits. Storage of water: The parenchyma cells of succulent plants store water. These cells are large with thin cell wall. They have thin layer of cytoplasm. These cells have large vacuoles. These vacuoles contain mucilaginous sap. This sap increases the water holding capacity of the cell. The parenchyma cells with uneven angular thickening which support young growing part of plant are called collenchyman. Collenchyma tissues form separate strands or continuous cylinder near the surface of the stem cortex, in petioles and along the vein of the leaves. Collenchyma tissues are absent in roots. Collenchyma, tissues are also absent in stem and leaves of many monocot plants. Collenchyma cells have living protoplasts. They are simple tissues and contain single type of cells. The cells are elongated with pointed and prismatic ends. They are capable of further growth and divisions. Collenchyma tissues also contain chloroplasts in green organs. Collenchyma form complete cylinder in stem. Collenchyma tissues are present in the margin of leaves. Their thickened primary wall is non-lignified. It is mostly composed of cellulose and poor in pectic substance. Therefore, it is elastic in nature. The angular thickenings are rich in cellulose. An additional layer of microfibrils is present inside the %all. In some cases, the cell N% all of collenchyma is sclerified. Sclerification occurs by the formation of lamella. The lamellae are rich in cellulose. Sometimes. these lamellae become lignified. Additional lamellae appear inside. It decreases the lumen of collenchymatous cells. Different collenchyma tissues have diflerent sizes and shapes. Mostly these cells are elongated with tapering ends. The longest collenchyma tissues are present in the central position. The shorter collenchyma tissues are present in the periphery. Angular collenchyma: The thickenings in the wall of these cells are present in the angles of the cells. They are found in the petioles of some plants. Lamellar collenchyma: The thickenings in these tissues are – present on the tangential walls of the cell. These are present in the stem cortex of some plants. Lacu ar collenchyma: In these tissues thickenings are present in with faces intercellular spaces. Lacunar collenchymas are prex, In the petiole of composite species. Very long and narrow sclerenchymatous cells with tapering ends are fibers. The length of the fibers varies greatly. Fibers are found in all parts of the plants. They are present in stern, roots and leaves. Fibers are also present in xylem and phloem. They may form component of vascular tissues. Or they are present– outside the vascular tissues. There are three types of fibers: Xy Ian. bast and septate fibers. Libiform fibers: These fibers have very thick Y all and simple pits. They are longer than the tracheids of that plant. Fihro-tracheids: They have intermediate thickness between tracheids and libilorm fibers. They have bordered pits. (e) Mucilaginous fibers: The innermost laver of these fibers is rich in cellulose. Ii has greater Nater holding capacity. Therefore, these fibers absorb %%ate’: and swell. These fibers are common in elastic Yood. 2. Bast fibers: These litsers are present in phloem and cortex tissues. In cortex, they form uninterrupted hollov. cylinders in !tic ground tissues. In phloem. the) form fiber sheath. 3 Septate fibers: These arc found in both xy lem and phloem. Ii hers have interim I septa. These are found in septate yood ti hers. Fibers develop from different meristems like procambium, cambium and ground meristem. Fibers also develop from parenchyma cells. The initials of the primary fiber appear earlier. They grow in length and form fibers. The secondary •fibers develop in the fully grown tissues. Phloem or bast fibers have great economic importance. These fibers give commercial fiber. These Fibers are used in rope and cloth making. Some important plants which give commercial fibers are: Hemp. Jute, Kenaf, Flax etc. Sonic commercial fibers are obtained from the leaf of monocot plants. These plants are: Manila hemp, Bowstring hemp, New Zealand hemp and pineapple fibers. The variable shaped sclerenchymatous cells with strongly lignified wall having simple pits are called sclereids. Any non — fibrous sclerenchymatous cell is sclercid. Sclereids are found in different parts of plants. –1 hey are present in epidermis, ground tissues and vascular tissues. The are present in the form of hard mass of cells. The seed coats of many seeds are entirely composed of sclereids. Sonic non-functional parenchyma cells are present in kascular tissues. The walls of these parenchyma cells become thick and they become sclereids. 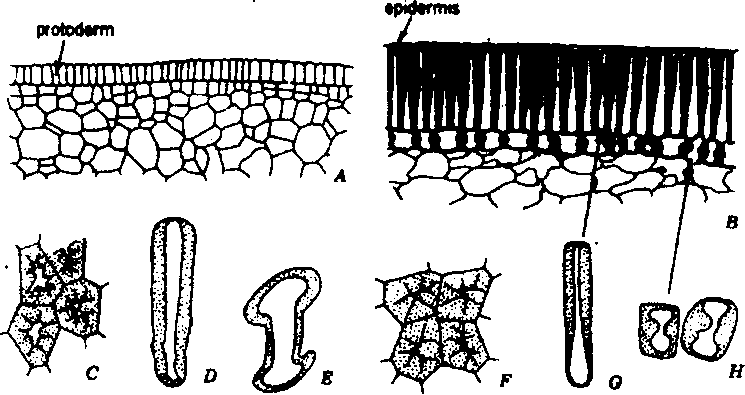 I. Brachysclereids or stone cells: They have isodiametric shape. They are found in phloem. cortex, bark of stem and fruits. Macrosclereids: They are rod shaped. They are found in testa of seeds. Astrosclereids: They are star shaped. They are mainly found in leaves. Osteosclereids: They are hone or spoon shaped. They are present in seed coat. The development of sclereid is coordinate and intrusive. I. Coordinated: In this ease, the cell wall continues to grow uniformly. This uniform growth on all sides without separation from neighbouring cells is called coordinated growth. 2. Intrusive: Later the growth becomes localized at certain points. It produces several processes. These processes grow outward and form branches. These branches penetrate into the middle lamella of the neighbouring cells. This type of growth is called intrusive growth.
. vessels have different thicknesse. These may he annular (ringed), spiral. scalariform wwl reticulate. These thicknesses are found in newly forred xylem. The vessels of mature xylem have uniform waits. Vessels are prusent only in dicot angiosperms. (h) Tracheids: The tracheary elements which are elongated tube like with tapering ends are called tracheids. They lack perforated plates in the end wall. Water moves from one tracheid to adjacent tracheids through pit membranes. Tracheids are present in all the vascular plants. The mature tracheids have characteristics thickenings like annular. spiral. reticulate and pitted. The two adjacent traeheids have bordered pits in the common wall. But the tracheal walls have simple pits. (a) Fiber tracheids: These are like tracheids. But they have %cry thick wall. These walls ha e some remnant of bordered pit. 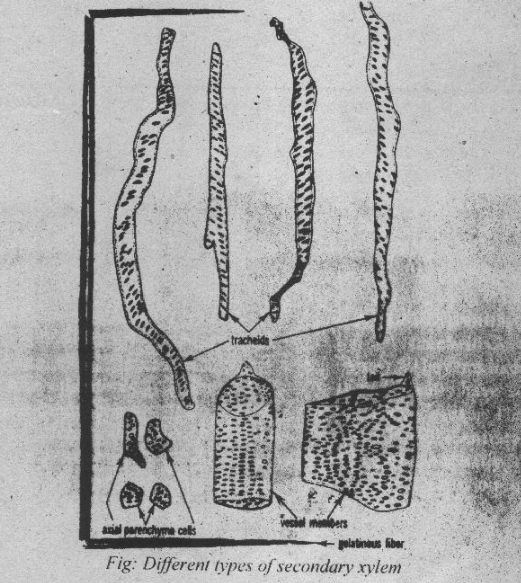 (b) Libriform tracheids: These fibers are narrower. They have remnant of simple pits in their %A ails. starch. The all of parenchyma cells may remain thin. Sometimes. they develop secondary wall with simple pits. The amount of parenchyma determines the softness and hardness of wood. Soft wood has a large number of parenchyma. Hard wood have tin+ er parenchyma. ‘Hie old tracheal elements become Wil­la net iona L The contents of the adjecent parenchyma In ‘grate into the tracheal elements through pits forming tylosis. Protoxylem: The early primary xylems are called protoxylem. Protoxylem appears at the beginning of differentiation. Protoxylem mostly becomes mature before elongation phase. They have annular and spiral thickenings. Protoxylems have few treachery elements. But they have a large amount of parenchyma cells. They are mostly present near the pith in stern. In root, they are present away from centre. Metaxylem: The xylems appear later during differentiation are called metaxylem, Metaxylem matures after elongation phase. Metaxylem has spiral. reticulate and pitted walls. Metaxylems are composed of tracheids. vessel. parenchyma and fibers. Metaxylems remians functional only in plants in which secondary growth does not occur (grasses). In other plants they become non-functiolial. Axial or vertical systems: In this case, xylem elements are present parallel to vertical axis. They mostly composed of dead tracheary elements (tracheid and vessels), fibers and parenchyma. Radial or transverse system: This system is composed of parenchyma cells only. Their long axes are at right angles to the long axis of organs. They form xylem rays. They are mostly composed of living cell. Phloem are living conducting tissues. They conduct prepared food form leaves to different part of the plant. They are also involved in storage of food and mechanical support. They are always associated with xylem to form aseular Ii . 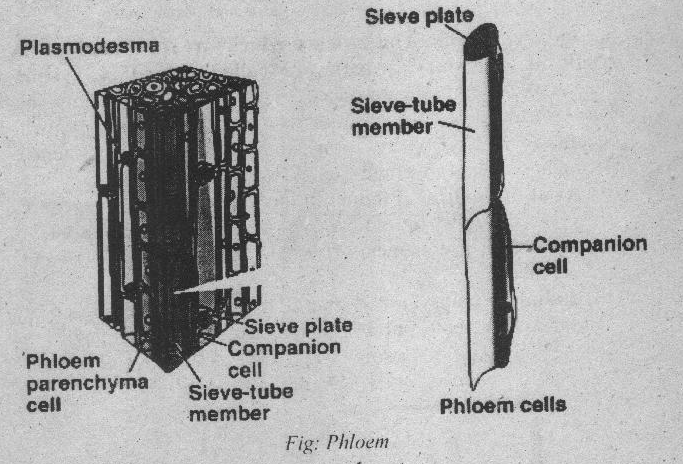 Phloem is composed of sieve elements. companion cells, phloem parenchyma and phloem litters. area with large pores. The sieve elements are divided into sieve tube members and sieve cells. Sieve cells: The sieve areas are not specialized in sieve cells. These areas are not restricted to some specific part of the wall of the cell. The sieve cells are arranged in longitudinal files. The sieve areas are present mostly in the adjacent walls of the sieve cells. The phloem of gymnosperms and lower vascular plants contain sieve cell only. sieve tuber members. Sieve areas are confined only to end walls of cells. They form sieve plates at end walls. The sieve tube members join end to end to form long tubes called sieve tubes. The phloem of angiosperms is composed of mainly sieve tube members. Companion cells: The thin walled parenchyma cells closely associated with the sieve elements are called companion cells. Companion cells cut off from the cells initial which later form sieve element. Companion cells are living. They arc physiologically active. They have a prominent nucleus. The siese tube element and companion cell have close contact. Companion cells are absent in gymnosperms and loser vascular plants. But certain parenchyma cells called albuminous cells are closely’ associated with sieve elements in these plants. These albuminous cells are similar 10 the companion cells in their function. Sclerenchyma: Sclerenchymatous fibers are commonly Ibund in both primary and secondary phloem. The fibers occupy the outer portion in the primary phloem. They are used as commercial Fibers. e.g. Hibiscus. Phloem fibers are elongated. They have thick secondary wall. They may be living or dead at maturity. the phloem fibers may be septate in certain cases. The phloem% are called bast due to presence of these fibers. The thick ssall of fibers is not lignified. It is composed of only cellulose. The fibers are also arraiiged axially (vertically ) in secondary ph loem s.
Parenchyma: Small parenchymas are present in both primary and secondary’ phloems. These parenchyma cells are arranged vertically in primary phloem. But these are arranged venically and radially in secondary phloem. These cells become thick wall in older portion of phloem and change into sclerenchyma cells. Phloem parenchyma cells are thin walled. They are living and physiologically active. They store different compounds like starch, tannins, and different crystals. Phloems may he -primary or secondary. Primary phloem: The phloem funned as a result of primary crmult is called primary phloem. Primary phloem is initiated in the embryo. It develops Man procambium. Primary phloem has two types. Protophloem: Protophloem is composed of elongated sieve elements only. They lack companion cells. Sieve tube elements lack nucleus. So they remain active only for a short time. Thus they soon disappear. Vertical system: Vertical system is composed of sieve elements, companion cells, phloem fibers and phloem parenchyma. Ray system: Ray system is composed of ray parenchyma only.